The iPhone Dev-Team has done it again: iOS 5 has been out for only a week or so, but the group has already come up with a tethered jailbreak for devices running Apple's latest software. Here's how to jailbreak your iOS 5 device using the iPhone Dev-Team's Redsn0w tool. Jailbreaking an iPhone allows users to gain root access to the device, as well as to install unauthorized applications. You might not know that Apple has a stringent App Store policy, and that it routinely rejects apps for a number of reasons, including smuttiness and other "content issues." Jailbreaking your iPhone will let you download unauthorized content from Cydia, which is the jailbroken equivalent of the App Store (don't worry--you'll still be able to use the real App Store). For the first time, users do not need to manually supply their device's IPSW file. What this means for you is that the new Redsn0w jailbreak is extremely quick and easy to perform on any iOS 5 device (minus the iPad 2 and the iPhone 4S). The Dev-Team is working on an untethered jailbreak, but for now the tethered version is all that's available. Can I Jailbreak My iOS Device? At the moment no jailbreak is available for the iPad 2 running iOS 5, or the new iPhone 4S. This jailbreak is currently incompatible with phones that have unlockable basebands. Do not try this if your phone has an unlockable baseband (and you want to keep it that way). Your baseband is unlockable/unlocked if you can use it on any (GSM, or SIM-card-using) network. You do not want to use this method if you either purchased an unlocked iPhone from Apple or unlocked your iPhone using a tool such as Ultrasn0w. This is a tethered jailbreak, which means that each time you reboot your iOS device, you'll need to have it connected to a computer running Redsn0w, the jailbreak program. Basically, you won't be able to reboot the device if you're not close to your computer, so keep that in mind. Before you do anything (even update to iOS 5), be sure to back up your device. How you back up depends on what type of data you have on your phone; I had a lot of photos, for instance, so I used Image Capture on my Mac to save all of my pictures to my computer. When you jailbreak your iOS device, you risk turning your new toy into a paperweight--and if you accidentally brick your iDevice, Apple probably won't help you out. I've never had any problems with jailbreaking, but that doesn't mean you won't, so proceed cautiously. To perform this jailbreak, your device must be running iOS 5. 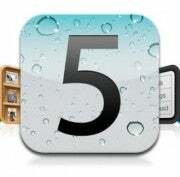 To get iOS 5, plug your device into your computer and open iTunes. Find the device and select Update. Your music, apps, and data may be erased from your device, but you can update to iOS 5 without losing your data if you prepare properly. To jailbreak your iOS 5 device, you'll be using the Redsn0w jailbreak tool from the iPhone Dev-Team. 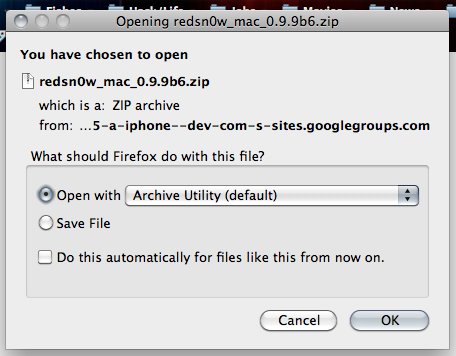 Download either Redsn0w 0.9.9b6 for Windows or Redsn0w 0.9.9b6 for Mac. Double-cliick on Redsn0w to open it. 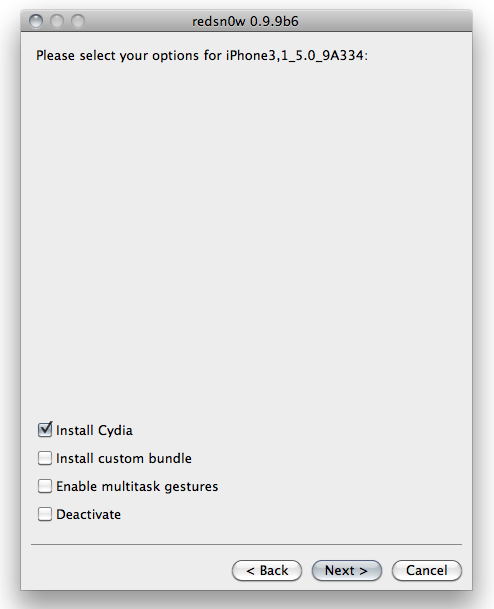 A window will show two options: Jailbreak and Extras. Choose Jailbreak. Make sure your device is plugged in, and turn it off (if it isn't plugged in, plug it in first and then turn it off). 1. Hold down the Power (upper-right) button for approximately 5 seconds. 2. Keep holding the Power button and hold down the Home button at the same time for 10 seconds. 3. 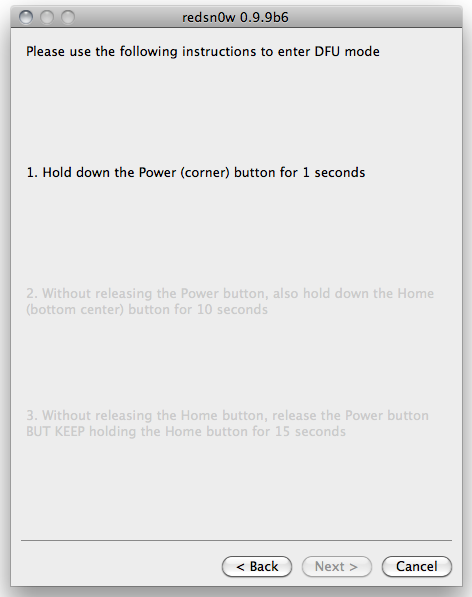 Release the Power button but keep holding the Home button for about 10 seconds. Once you enter DFU mode, Redsn0w will do the rest. Redsn0w will go through a series of screens--don't do anything, just wait. Once your phone is jailbroken (don't unplug it yet!) Redsn0w will ask you to 'select your options'. You'll see some stuff flash across your iOS device's screen, and then your device will reboot (tethered) in a jailbroken state. To accomplish this, connect your device to your computer and open Redsn0w. Click Extras and then Just boot. The program will prompt you to enter DFU mode, and then your device will reboot. That's it--your iOS 5 device is now jailbroken. For more information, tips, and answers, check out the iPhone Dev-Team's blog.